Its unusual for something like this to generate so much controvery and hysteria, but then again this product isn't usual. Well that was a lousy opening sentence. In short: I tried the Vegemite iSnack 2.0 spread this evening and found it surprisingly good. However I side with virtually the entire population of Australia in decrying the name as terrible and a missed opportunity. Hold on, let me finish this cracker. 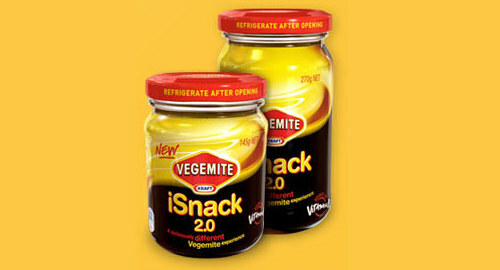 For those of you outside Australia or for those of you in Australia who have been living under a rock for the last couple of days, the spread and Australian cultural icon Vegemite referenced in Men At Work's (I come from a land) Down Under has a new flavour, and nobody seems to be pleased about the name which won the naming competition. While I agree that it would be akin to renaming Uluru iUluru or the Sydney Harbour Bridge and Opera House the iBridge and iHouse with the same resulting cultural insignificance, I think its brilliant marketing. The team behind it have got such a surge in interest and free publicity on television, in newspapers and online, including blog posts like this. Had they named it something sensible and clever, it would not have got the level of coverage it has, and to be honest I might not have gone out and bought a jar of it this evening as a result. As far as I know, no jars have been produced with the name and a small part of me thinks none ever will, it's simply a marketing ploy. I wouldn't be at all surprised to see shelves stocked with something else soon. If not though, iMight have to give up eating Vegemite for a while. Even though I spent most of my life in Singapore and have far less in common with my Aussie bretheren as a result, I still feel violated that they'd call my Vegemite something like that!